Sand moulding, or rather the casting in naturally bonded sand can be traced back to 17th century AD originating in France. Modern casting industry’s demand of constant quality of casting sands led to a decline in the use of sand which is bonded naturally. A few art foundries in Germany, though, are still knowledgeable therein and use it for casting purposes products. Due to the high expenditure of human labour it is only a question of time until all art foundries will work with the lost-wax process. The main difference to modern casting sands are the utilized binders. In naturally bonded sand this is usually a percentage of clay. In industrial sand they are Bentonite (mainly a clay mineral called Montmorillonite), Furans, Phenolic resin or similar chemical compounds. Since this page is concerned with archaeometallurgy we will dismiss all the explanations on modern casting technologies. 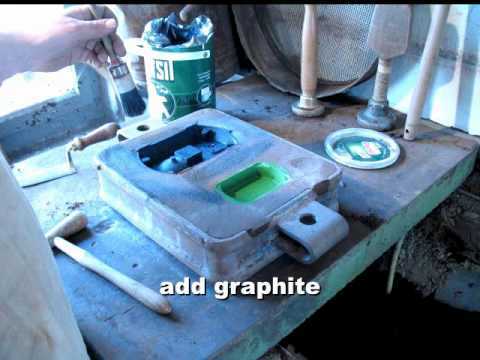 The stop motion animation shows the fabrication of a green sand mould with naturally bonded sand. It is a reconstruction of a Zeiss Junior microscope foot. This mould was made for aluminum casting. Since sand on its own is not enough to produce a sand mould, a frame for holding the sand in place is needed. In foundry terms this is referred to as a flask. Flasks are usually rigid frames without fixed bottom or top and consist of two parts: a lower one also known as drag and an upper one which is called cope. So called flask pins at the sides of the cope and drag ensure a proper alignment of upper and lower half during moulding and later, once the pattern is withdrawn, during pouring. The sand is moist or green when it is compressed into the flask, and has to be dried in a kiln before pouring. Does sand really stay in the mould!? Two processes are responsible for the stability of the sand once it is compressed. (a) The dilatant nature. (b) The sand has 8-15% clay as binder and up to 5% of water contents. A simple test is to compress a handful of sand and throw this about half a meter into the air, and if you can subsequently catch it as a whole, you might just have a good moulding sand. There are other important criteria to be matched: Permeability, refractoriness and a fine grain for surface smoothness. Fine quartz sand (or rather coarse silt) fulfills all conditions perfectly, if there is a clay contents between 8-15 wt%. Moulding with naturally bonded sand is easily one of the most fascianting techniques, because of its simplicity and its apparent defiance to obey the law of gravity. Once you have seen a flask -a metallic frame that has no bottom and no lid- being turned without the sand dropping out of it you will surely believe me. Best suited for sand casting are simple patterns without too many undercuts. Because the pattern needs to be withdrawn to create the mould cavity, the flask consists of two halves. To mould a pattern you first have to decide were the parting of the mould is. The parting is that line, where the mould cuts the cavity in two halves. It is evident that neither side can have undercuts, or you cannot withdraw your pattern. First we create a false half, which holds the pattern in place: The pattern is buried up to the parting line of the pattern in sand. The sand is compacted and smoothed to produce a nice parting surface arounf the pattern. Then you powder this surface with a parting agent, to prevent the green sand sticking to the model or the parting surface. Put on the cope, put finely sieved sand on top of pattern and parting surface and compact it carefully with your hands. Put more sand into the cope and compress it with tampers and mallets. The whole flask is now turned, and the false half (drag) removed. It can be discarded and is shaken out. Put the drag back on, and repeat the steps previously described for the cope. After the drag has been made it is removed again, however, this time carefully, as to avoid damage to the mould cavity (You might want to lift the drag by pushing wedges into the four corners of the flask and thus to lever the drag slowly and in a controlled way from the cope. After that you tap the pattern and withdraw it carefully. Now you have produced the mould cavity. Downsprue, sprues and vents have to be cut into the sand, so the metal melt can reach the cavity. After drying the mould in the kiln it is ready for pouring. Cope and drag are reunited, clamped and metal is poured in. After casting shake the sand: your first cast! What happens with more complicated patterns, e.g. sculptures? Can you cast them in sand? Yes, you can; if I did not manage to confuse you as yet, you may read further on the Stückform process here. This entry was posted on Friday, June 28th, 2013 at 18:49and is filed under . You can follow any responses to this entry through the RSS 2.0 feed. You can leave a response, or trackback from your own site.